For the sewing enthusiast who wants to amplify their creativity – the PFAFF® creative ™ 1.5 sewing and embroidery machine is here. Original IDT™ System – Integrated Dual Feed only from PFAFF® for over 45 years! Absolutely even fabric feed from both the top and bottom of your sewing project. This system works with any stitch forward or reverse at any stitch length or width. Engage and disengage easily when needed. German Innovate Design – built to make sewing easy and to achieve the professional results that every sewer and quilter wants. The PFAFF® creative™ 1.5 sewing and embroidery machine with its innovative features, durability and ease of operation will amplify your creativity. Large Embroidery Area – The PFAFF® creative™ 1.5 sewing and embroidery machine features a large embroidery area, up to 240 x 150 mm. Embroidery your unique, personal creations in one hooping with the large creative™ MASTER HOOP. High Embroidery Speed – No other sewing and embroidery machine in this price range embroiders faster. With the faster embroidery speed you will complete your embroideries more quickly, maintaining the quality and precision you expect. Embroidery Into PC Software included – Adjust, personalize and combine your embroidery designs; create monograms – all on your PC computer. Rotate, mirror, scale and resize any design with the option to keep stitch density constant. Use the intelligent Colorsort Feature to reduce the number of thread changes when you embroider. Extensive lettering choices – including 10 specially digitized fonts and the QuickFont Wizard. 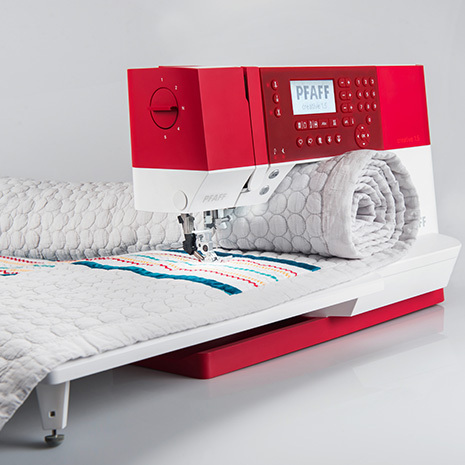 Large Sewing Space – The PFAFF® creative™ 1.5 sewing and embroidery machine is the perfect choice for quilters, home decor sewers, fashion enthusiast – just about everyone who creates. The 200mm sewing area to the right of the needle is ideal for sewing large amounts of fabric or batting. Electronic Thread Tension – Optimal needle thread tension is set electronically for every stitch and embroidery. This makes sewing so simple! Needle Up/Down – Set the needle to stop in the up or down position. When set down in the fabric you enjoy the pivot feature. Perfect for applique and more!! Start/Stop – Sew without the foot control – Makes sewing long seams so easy and effortless. Wide Variety of Beautiful 7mm Stitches – Select from the 150 stitches, including utility, buttonholes, quilt stitches, needle art stitches, satin stitches, decorative stitches and optional feet stitches. Built-in Sewing Alphabets – Enjoy stitching the Block and Cyrillic alphabets in upper case and lower case, plus numbers and symbols to personalize your sewing project. Stitch Sequencing and Memory – Combine and save up to 60 stitches and/or letters in the sequence memory – sew in one step repeatedly. Personal Stitch Setting – Change the setting on built-in stitches to your personal liking. Snap-on/Snap-Off Presser Foot – Changing is easy!! No screwdrivers or other tools are needed – just snap them on or off. Top Loaded Bobbin – Easy access for changing bobbins or viewing how much thread you have left on the bobbin. Mirror Image – Flip the stitch or embroidery design side-to-side and or end-to-end for even more creative possibilities. Automatic Tie-off – Ties off automatically at the beginning and/or at the end of a seam for a quick easy finish. 101 Fantastic Embroidery Designs – Included! Created by fashion designers for the PFAFF® creative™ 1.5 sewing and embroidery machine line, high quality, a mix of sizes and techniques for a multitude of embroidery options. Embroidery Fonts – Included! Curlz and Graphite in three different sizes. Upper and lower case letters, plus numbers and symbols to personalize any embroidery project. USB Connection – Transfer embroidery design quickly and easily between your creative™1.5 and your computer with the USB Embroidery stick. Thread Snips – Automatically cut top and bobbin threads at the touch of a button, a huge time saver. Info Button – Simply touch to see the important sewing recommendations on the graphic display. Updateable – Download the latest software version from the internet; update quickly with a USB stick, easy way to ensure you are using the latest software at all times. Languages – Choose from different languages in the Settings menu. Make sure your PFAFF® creative™1.5 speaks your language. Bobbin Winding – from the Needle! No need to rethread to wind bobbins when you wind directly from the needle. Winding stops automatically when your bobbin is full. Graphic Display – The graphic display lets you view all your selections and options. Stitches are shown in real size. Accessory Tray – Makes your sewing surface bigger and keeps all your accessories in order. Remove the tray fro easy access to the free arm. Accessory Feet Included – 8 Different feet for all your basic needs! Standard presser foot 0A with IDT™, Fancy stitch foot 1A with IDT ™, Fancy stitch foot 2A, Blind-hem foot3 with IDT™, Zipper foot4 with IDT™, Sensormatic buttonhole 5Afoot, Manual buttonhole foo 5Mt, Sensormatic free-motion/Embroidery foot 6A. USB Embroidery Stick – Included! The 4GB USB embroidery stick holds designs included with the machine plus can be used as convenient storage, back-up and transfer of your personal embroidery files. Embroidery Into PC Software (English Only) – Instant additional freedom for your creativity! Adjust, personalize and combine your embroidery designs; create beautiful monograms – all on your PC Computer. Use the intelligent Colorsort Feature to reduce the number of thread changes when you embroider. Extensive lettering choices – including 10 specially digitized fonts and the Quickfont Wizard to create embroidery fonts automatically from most TrueType® and OpenType® fonts on your computer. 72 Super Designs that you can adapt for any project, Resize easily, maintaining perfect stitch density. creative™ Endless Hoop II (180x100mm), creative™ All Fabric Hoop II (150x150mm), creative™ Texture Hoop (150x150xmm), creative™ 120 Square Hoop (120x120mm), creative™ Petite Square Hoop (80x80mm), creative™ Metal Hoop (180x130mm). All hoops come with the quick release system for easy re-hooping. Click here to view PDF of embroidery designs.